Is America Becoming an Authoritarian State Under an Autocratic President? There are disturbing signs that America’s strength as a democracy has weakened as reflected in widespread support for authoritarianism and an autocratic President. Several political experts, citing evidence, have sounded an alarm about the erosion of democracy and a few even suggest the existence of similarities to fascism in history. In a sense, there is a bitter irony here, if their perspectives are accurate, as America has long been recognized as the world’s earliest and strongest democracy. An autocracy is a system of government in which supreme power is concentrated in the hands of one person, whose decisions are subject to neither external legal restraints nor regularized mechanisms of popular control (except perhaps for the implicit threat of a coup d’état or mass insurrection). Absolute monarchies (such as Saudi Arabia, the United Arab Emirates, Oman, Brunei and Swaziland) and dictatorships (such as Turkmenistan and North Korea) are the main modern-day forms of autocracy. In earlier times, the term “autocrat” was coined as a favorable feature of the ruler, having some connection to the concept of “lack of conflicts of interests” as well as an indication of grandeur and power. The Russian Tsar for example was styled, “Autocrat of all the Russias”, as late as the early 20th century. Authoritarianism and Totalitarianism are levels of power that the government wields over the private lives of individual citizens. An Authoritarian regime will exercise some power over people’s private lives, but it does not control everything. Tito’s Yugoslavia and Fascist Italy were good examples of Authoritarian regimes. Totalitarianism existsi when the government seizes total, or near total control over every living being and knows everything about their private lives. Nazi Germany and Stalin’s Soviet Union and today’s North Korea are good examples of Totalitarian regimes. Fascism is a counter to Socialism and Communism, but is not based on any singular philosophy. In general, Fascist movements preach in favor of militarism, extreme nationalism, anti-communism, and anti-social change. Some, like the Nazis, also added racial purity as another major cause for Fascism to support, which many times has earned the term “Nazism” to differentiate itself from Mussolini’s Italy. Fascism is on the far fringes of the political Right. Nazi Germany, Franco’s Spain, and Mussolini’s Italy are the best examples of Fascist governments. Hitlerism is a term applied by the Western Allies to anyone who agreed with Nazi Party racial theory and Nazi Party policies, largely because Hitler was the leader of the Nazi Party and was at war with the Allied Powers. Both totalitarianism and military dictatorship are often identified with, but need not be, an autocracy. Totalitarianism is a system where the state strives to control every aspect of life and civil society. It can be headed by a supreme leader, making it autocratic, but it can also have a collective leadership such as a commune, junta, or single political party. In politics, populism refers to a range of approaches which emphasize the role of “the people” and often juxtapose this group against “the elite”. There is no single definition of the term, which developed in the 19th century and has been used to mean various things since that time. Few politicians or political groups describe themselves as “populists”, and in political discourse the term is often applied to others pejoratively. Within political science and other social sciences, various different definitions of populism have been used, although some scholars propose rejecting the term altogether. A common framework for interpreting populism is known as the ideational approach: this defines populism as an ideology which presents “the people” as a morally good force against “the elite”, who are perceived as corrupt and self-serving. Research conducted by Bright Line Watch, the group that organized the Yale conference on democracy, shows that Americans are not as committed to these norms as you might expect. Another startling finding is that many Americans are open to “alternatives” to democracy. In 1995, for example, one in 16 Americans supported Army rule; in 2014, that number increased to one in six. According to another survey cited at the conference, 18 percent of Americans think a military-led government is a “fairly good” idea. 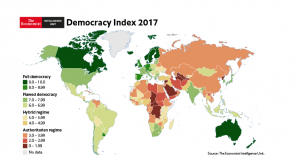 The Democracy Index 2016, released in January 2017, now lists the United States as a flawed democracy. The basis for the decline was not the most recent presidential election. Instead, the report argues that Donald Trump benefited from a lack of popular trust in American government, a lack that also led to the demotion. Indeed, the ranking of the United States had been dropping for a number of years; the country was just barely included at the bottom of the list of fully functioning democracies in 2015. In 2016, candidates running for federal office spent a record $6.4 billion on their campaigns, while lobbyists spent $3.15 billion to influence the government in Washington. Both sums are twice that of 2000 levels. This reality sparked former president Jimmy Carter to lament that any candidate to the Presidency of the United States needs at least 200 million dollars to set foot on the path to the White House. “There’s no way now for you to get a Democratic or Republican nomination without being able to raise $200 or $300 million or more,” Carter told Oprah Winfrey on her talk show in September 2015. Looking at the most recent nationwide election in each OECD nation, the U.S. placed 26th out of 32. The highest turnout rates among OECD nations were in Belgium (87.2%), Sweden (82.6%) and Denmark (80.3%). One factor behind Belgium’s high turnout rates – between 83% and 95% of VAP in every election for the past four decades – may be that it is one of the 24 nations around the world (and six in the OECD) with some form of compulsory voting. In 2011, when Newsweek administered the United States Citizenship Test to over 1000 American citizens, 38% of Americans failed. This widespread civic illiteracy is not just shameful, it is dangerous. How people expect to hold their representatives accountable when 61% don’t know which party controls the House and 77% can’t name either of their state’s senators? How can Americans expect to exercise their rights when over one third can’t name any of the five rights protected by the First Amendment (freedom of speech, religion, the press, protest, and petition)? Partisan gerrymandering is commonly used to increase the power of a political party. In some instances, political parties collude to protect incumbents by engaging in bipartisan gerrymandering. After racial minorities were enfranchised, some jurisdictions engaged in racial gerrymandering to weaken the political power of racial minority voters, while others engaged in racial gerrymandering to strengthen the power of minority voters. Half of Americans think the United States is in “real danger of becoming a nondemocratic, authoritarian country.” A majority, 55 percent, see democracy as “weak” – and 68 percent believe it is “getting weaker.” Eight in 10 Americans say they are either “very” or “somewhat” concerned about the condition of democracy here. These are among the sobering results of a major bipartisan poll that was commissioned by the George W. Bush Institute, the University of Pennsylvania’s Biden Center and Freedom House, which tracks the vitality of democracies around the world. The three groups have partnered to create the Democracy Project, with the goal of monitoring the health of the American system. Autocratic derives from the words auto (Greek for self) and cratic, which implies rule. Autocratic leaders often view themselves like automobile engines that drive people under their tutelage or command, whether it’s a mayor of a large city, a company CEO or an agency director. yles are more suitable for environments with experienced staff. Some people are uncomfortable working for autocratic leaders because they feel it epitomizes authoritarianism, even if it’s the most suitable management style for training inexperienced staff or implementing consistent quality control processes. It may seem incongruous to think of autocratic leaders as self-driven. But if their role in business, government or other organizations is to drive others to perform at their best and accomplish tasks without making mistakes, then the description is appropriate. The term authoritarian, often used in conjunction with autocratic, seems more appropriate to describe leaders who make decisions with little or no input from others. But if you compare autocratic leaders to democratic and laissez-faire leaders, the definition makes sense. Remaking Partisan Politics through Authoritarian Sorting, a forthcoming book by the political scientists Christopher Federico, Stanley Feldman and Christopher Weber. The authors found that in 1992, 62 percent of white voters who ranked highest on the authoritarian scale supported George H.W. Bush. In 2016, 86 percent of the most authoritarian white voters backed Trump, an increase of 24 percentage points. In South Carolina, a CBS News exit poll found that 75 percent of Republican voters supported banning Muslims from the United States. A PPP poll found that a third of Trump voters support banning gays and lesbians from the country. Twenty percent said Lincoln shouldn’t have freed the slaves. Federico, writing with Christopher Johnston of Duke and Howard G. Lavine of the University of Minnesota, published “Open versus Closed: Personality, Identity, and the Politics of Redistribution,” which also explores the concept of authoritarian voting. Johnston argues “Over the last few decades, party allegiances have become increasingly tied to a core dimension of personality we call ‘openness.’” Citizens high in openness value independence, self-direction, and novelty, while those low in openness value social cohesion, certainty, and security. Individual differences in openness seem to underpin many social and cultural disputes, including debates over the value of racial, ethnic, and cultural diversity, law and order, and traditional values and social norms. In 2009, Marc J. Hetherington of Vanderbilt and Jonathan D. Weiler of the University of North Carolina, wrote one of the fundamental texts on this topic, Authoritarianism and Polarization in American Politics. In it, Hetherington and Weiler argue that preferences about many of the new issues on the American political agenda, such as gay rights, the war in Iraq, the proper response to terrorism, and immigration are likely structured by authoritarianism. Karen Stenner’s seminal book The Authoritarian Dynamic describes how authoritarianism has grown more rapidly and in greater force than anyone had imagined, in the personage of one Donald Trump and his norm-shattering rise. According to Stenner’s theory, there is a certain subset of people who hold latent authoritarian tendencies. 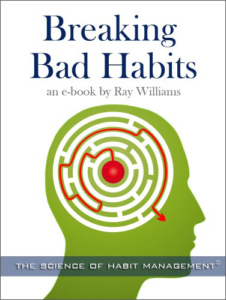 These tendencies can be triggered or “activated” by the perception of physical threats or by destabilizing social change, leading those individuals to desire policies and leaders that we might more colloquially call authoritarian. Authoritarians prioritize social order and hierarchies, which brings, for them, a sense of control to a chaotic world. Challenges to that order — diversity, influx of outsiders, breakdown of the old order — are experienced as personally threatening because they risk upending the status quo order people equate with basic security. Authoritarianism experts agree on the basic causality of authoritarianism. People do not support extreme policies and strongman leaders just out of an affirmative desire for authoritarianism, but rather as a response to experiencing certain kinds of threats. 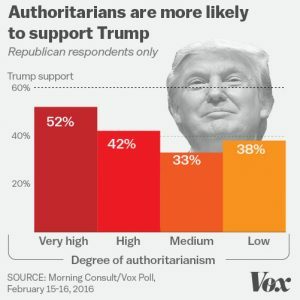 A survey found that 44 percent of white respondents nationwide scored as “high” or “very high” authoritarians, with 19 percent as “very high.” That’s actually not unusual, and lines up with previous national surveys that found that the authoritarian disposition is far from rare. Using military force over diplomacy against countries that threaten the United States. Changing the Constitution to bar citizenship for children of illegal immigrants. Imposing extra airport checks on passengers who appear to be of Middle Eastern descent in order to curb terrorism. Requiring all citizens to carry a national ID card at all times to show to a police officer on request, to curb terrorism. Allowing the federal government to scan all phone calls for calls to any number linked to terrorism. What these policies share in common is an outsized fear of threats–physical and social, and, more than that, a desire to meet those threats with severe government action — with policies that are authoritarian not just in style but in actuality. New psychology research provides evidence that Republicans tend to have slightly more psychopathic personality traits compared to Democrats. “Psychopathic traits with their associated empathy deficits appear relevant to the discussion of political attitudes and political candidates,” wrote the authors of the study, which was published in the journal Personality and Individual Differences. For their study, the researchers surveyed 304 American adults using Amazon’s Mechanical Turk. The participants completed measures of psychopathy, empathy, political beliefs, and political affiliation.The study was based on the triarchic conceptualization of psychopathy, which breaks psychopathy down into three facets: boldness, meanness, and disinhibition. The researchers found that psychopathic boldness and meanness tended to be higher in Republicans compared to Democrats. Disinhibition was not related to political affiliation. But whether people agreed with statements like “I get in trouble for not considering the consequences of my actions” was unrelated to their politics. 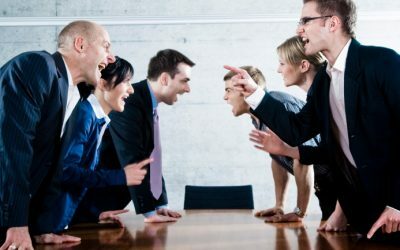 The researchers also found that boldness was associated with conservative opinions on economic issues, while meanness was associated with conservative opinions on social issues. Boldness was linked to opposition to government spending, immigration, and gay rights. Meanness was associated with opposition to universal healthcare, marijuana legalization, equal pay for women, and affirmative action. The new study builds on previous research, published in 2013 and 2014, which found that psychopathic traits tended to be higher among political conservatives. “Considering the political success of presidential candidates with higher levels of psychopathic traits (i.e., fearless dominance) in the US (Lilienfeld et al., 2012), it may be surmised that popular political candidates championing conservative opinions (e.g., restricting free speech and immigration, decreasing gun control and taxation) may possess elevated psychopathic traits,” the authors of the study concluded. Authoritarian/autocratic states often are characterized by militarism. That militaritarism can be externally characterized by war and military excursions. The U.S. has been virtually continuously at war since the end of WWII, and its military is the largest and most powerful in the world, consuming a substantial part of the federal budget. (See my article, “Is America Addicted to War?”). Yet there are also signs that militarization has occurred internally. Miller explains: “In these vast domains, Homeland Security authorities can institute roving patrols with broad, extra-constitutional powers backed by national security, immigration enforcement and drug interdiction mandates. There, the Border Patrol can set up traffic checkpoints and fly surveillance drones overhead with high-powered cameras and radar that can track your movements. Within twenty-five miles of the international boundary, CBP agents can enter a person’s private property without a warrant.” According to federal statutes, regulations, and court decisions, CBP officers have the authority to question and detain, without a warrant, any person trying to gain entry into the country and seize their belongings. CBP can also question individuals about their citizenship or immigration status and ask for documents that prove admissibility into the country. And finally CBP officers can arrest and detail individuals for up to 14 days without filing a charge against them. The Customs and Border Protection (CBP) agency, which is an arm of the Department of Homeland Security, made up of more than 60,000 Customs and Border Protection employees, and supplemented by the National Guard and the U.S. military. Government agents continue to roam further afield of the so-called border as part of their so-called crackdown on illegal immigration, drugs and trafficking. Consequently, greater numbers of Americans are being subject to warrantless searches, ID checkpoints, transportation checks, and even surveillance on private property. In addition, America’s police forces—which look like, dress like, and act like the military—have undeniably become a “standing” or permanent army, one composed of full-time professional soldiers who do not disband, which is exactly what the Founders feared. With the police increasingly posing as pseudo-military forces—complete with weapons, uniforms, assault vehicles, etc.—a good case could be made for the fact that SWAT team raids, which break down the barrier between public and private property, have done away with this critical safeguard. Unfortunately, the increasing militarization of the police, the use of sophisticated weaponry against Americans and the government’s increasing tendency to employ military personnel domestically have all but eviscerated historic prohibitions such as the Posse Comitatus Act. In fact, many questionably legal and ethical government actions can be traced back to the DHS, its police state mindset, and the billions of dollars it distributes to police agencies in the form of grants to transform them into extensions of the military: militarizing police; incentivizing SWAT teams; spying on protesters; stockpiling ammunition; distributing license plate readers to police agencies; contracting to build detention camps; tracking cell-phones with Stingray devices; carrying out military drills and lockdowns in American cities; using the TSA to carry out soft target checkpoints; directing government workers to spy on Americans; conducting widespread spying networks using fusion centers; utilizing drones and other spybots on civilians; funding city-wide surveillance cameras; and carrying out Constitution-free border control searches. Many urban police forces are trained like, and look like the military. Battlefield tactics. Militarized police. Riot and camouflage gear. Armored vehicles. Mass arrests. Pepper spray. Tear gas. Batons. Strip searches. Drones. Less-than-lethal weapons unleashed with deadly force. Rubber bullets. Water cannons. Concussion grenades. Military vehicles. This is what martial law looks like, when a government disregards constitutional freedoms and imposes its will through military force, only this is martial law without any government body having to declare it. This is martial law packaged as law and order and sold to the public as necessary for keeping the peace. It doesn’t matter whether the so-called threats to national security posed by terrorists, extremists or immigrant armies ever became a reality. Once the government acquires—and uses—additional powers, it does not voluntarily relinquish them. 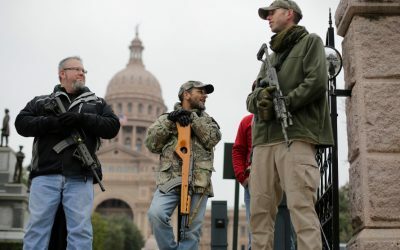 This state of near-lockdown has been helped along by government policies and court rulings that have made it easier for the police to shoot unarmed citizens, for law enforcement agencies to seize cash and other valuable private property under the guise of asset forfeiture, for military weapons and tactics to be deployed on American soil, for government agencies to carry out round-the-clock surveillance, for profit-driven private prisons to lock up greater numbers of Americans, for homes to be raided and searched under the pretext of national security. Authoritarian populism is a significant challenge to democratic politics on both sides of the Atlantic. An increasing number of extreme populist politicians are making headway across the world’s established democracies. Economic considerations also shape attitudes toward race, immigration, and globalization. Western societies, including the United States, are becoming more diverse, especially in urban centers. Cosmopolitan urban centers, such as the metropolitan areas on the East and West Coasts, are seeing concentrations of economic dynamism, growth, and new opportunities. Combining diversity, openness, and economic dynamism, cities have grown into an economic and cultural antithesis of the less diverse and economically stagnant exurban and rural areas. In the U.S. context, the rise of authoritarian populism has gone hand in hand with the decline of trust in government and political institutions; the decline in lawmakers’ responsiveness to the public’s expressed policy preferences; and the rise of ideological polarization. Taken together, these should be seen as warning signs of the declining strength of America’s democracy. The decline of trust in the U.S. government dates back to the mid-1960s.Fifty years ago, close to three-quarters of the U.S. population trusted the federal government; that number has dropped to below 25 percent. During the first year of the Trump administration, this decline has continued.A similar erosion of trust can be seen in other areas of U.S. society—such as media, churches, corporations, and universities. This makes it difficult to see the decline of political trust as an isolated phenomenon. Furthermore, in some situations, low levels of trust in government could be benign. Citizens who are distrustful and scrutinizing, for example, might be in a better position to hold elected representatives accountable than citizens who hold a more romantic view of politics and politicians. Populism is spreading across the globe. In Europe, populist parties have won victories in Greece, Hungary, Italy, Poland, Slovakia, and Switzerland; and they have joined governing coalitions in Finland, Norway, and Lithuania. More broadly, strongmen with populist agendas have become president — including Rodrigo Duterte in the Philippines and Donald Trump in the United States. Various causes lie behind populist upsurges, ranging from increased economic hardship and inequality to growing frustrations with globalization and immigration. But the consequences are worrisome, because research suggests the very real possibility of democratic backsliding worldwide. Populist takeovers are associated with personalist dictatorships and the dismantling of democratic institutions. Contemporary populists share the objectives of their historical predecessors in Latin America and Europe. They promote a disdain for traditional political institutions, praise the advantages of strong and decisive leadership, and vocalize deep distrust of experts and the “establishment.” Today’s populists use new tactics, however. They no longer signal a quick break from democracy, but rather set in motion a subtle chipping away at democratic institutions. Venezuela’s Hugo Chávez, Russia’s Vladimir Putin, and Turkey’s Recep Tayyip Erdogan illustrate this dynamic. Rather than gaining control through coup or revolution, which can incite domestic and international pushback, these leaders came to power via elections. Once in office, they stoked widespread discontent to undermine institutional constraints on their power, sideline the opposition, and weaken civil society. The tactics used are straightforward – and subtle enough each step of the way to make it hard for supporters of democracy to stop. Populist regimes place loyalists and allies in key positions regardless of competence, especially in the judiciary and security services. Traditional media is muzzled, and government turns to alternative outlets to push its message. Today’s populist tactics represent a shift in how democracies fall apart. “Authoritarianization” is the term for the kind of regime change where elected leaders lead the way in undermining democratic institutions. Historically, military coups were the dominant pathway. Data on authoritarian regimes show that from 1946 to 1999, 64 percent of the democracies that collapsed into authoritarianism did so as the result of coups. From 2000 to 2010, however, authoritarianization has been on the rise, representing 40 percent of all democratic failures, equal to the percentage of failures through coups. All signs point to populist-fueled authoritarianization becoming the most common pathway from democracy to autocracy. Not only are we seeing a change in how democracies wane; a new type of dictatorship is emerging. Populist politics gives rise to “personalist dictatorships,” where power is concentrated in the hands of a single individual. 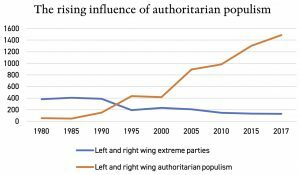 From 2000 to 2010, this happened in 75% of authoritarian transitions, compared to less than half the time in such transitions from 1946 to 1999. We have seen this personalist route from election to authoritarianism in Russia, Turkey, and Venezuela, as well as in Peru under Alberto Fujimori. Even where populist strongmen have not fully dismantled democracy, we often see them enjoying a disproportionate share of power, as in Nicaragua under Daniel Ortega, Ecuador under Rafael Correa, Hungary under Viktor Orban, and Poland under Jaroslaw Kaczynski. Growing literature in political science finds that personalist dictatorship is associated with a wide range of ruinous outcomes. Even compared to other kinds of dictatorships, personalist regimes pursue the riskiest and most aggressive foreign policies. They are the most likely to invest in nuclear weapons, initiate interstate conflicts, and launch wars against democracies. Weakened accountability mechanisms enable personalist leaders to take risks without facing consequences for poor choices. This is more the case for personalist regimes than even for other types of authoritarian regimes. Cases in point include the adventurism of Saddam Hussein in Iraq, of Idi Amin in Uganda, and of the Kim family in North Korea. The annexation of Crimea by Russia’s Vladimir Putin is another prominent example. Existing research also shows that personalist dictatorships stoke xenophobic sentiments and mismanage foreign aid allocations. And when such regimes collapse, they are unlikely to revert to democracy. In short, populist-fueled creeping authoritarianism is potentially triggering a global spread of highly adventurist and dangerous regimes. Conditions giving rise to populist candidates and parties are probably not going to disappear in the near future. Problematic trends include slow growth and rising economic inequalities and joblessness; rising frustrations with immigration and refugee crises; and citizen perceptions that traditional political establishments are crooked and corrupt. In combination, such trends may very well continue fuel support for populist leaders worldwide, putting elected strongmen in position to shift democracies in authoritarian directions. Pushing back against this threat to democracy will be difficult to accomplish precisely because of the subtle means through which today’s populists implement strongman rule. Because they incrementally dismantle democratic institutions and norms, no single dramatic change triggers widespread mobilization of opposition. All too often, populist leaders can frame vocal critics as destabilizing provocateurs, fragmenting resistance and rendering it ineffective. In short, the global surge in populism poses a serious challenge to democracy. A first step toward mitigating this threat is for citizens and leaders in many countries to recognize what is occurring and how. The main problem people have in understanding Fascism is that they confuse it with Nazism. They have heard that Hitler was a fascist and so America can never be like that. In a preface to The Mass Psychology of Fascism, Wilhelm Reich wrote that “‘fascism’ is only the organized political expression of the structure of the average man’s character.” The fact that authoritarian inclinations are so mundane and quotidian means that they are a constant danger—and a constant source of anxiety for the liberal. A widely accepted definition of fascism and fascist governments has been a complicated and highly disputed subject. The exact nature of fascism and its core tenets has been debated amongst historians, political scientists, and other scholars since Benito Mussolini first used the term in 1915. A significant number of scholars agree that a “fascist regime” is foremost an authoritarian form of government, although not all authoritarian regimes are fascist. 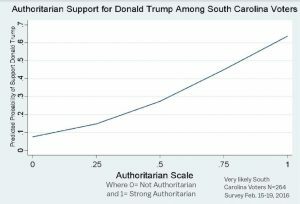 Authoritarianism is thus a defining characteristic, but most scholars will say that more distinguishing traits are needed to make an authoritarian regime fascist. Similarly, fascism as an ideology is also hard to define. Originally, it referred to a totalitarian political movement linked with corporatism which existed in Italy from 1922 to 1943 under the leadership of Benito Mussolini. Many scholars use the word “fascism” without capitalization in a more general sense, to refer to an ideology (or group of ideologies) which was influential in many countries at many different times. For this purpose, they have sought to identify what Roger Griffin calls a “fascist minimum”—that is, the minimum conditions that a certain political movement must meet in order to be considered “fascist”. According to most scholars of fascism, there are both left and right influences on fascism as a social movement, and fascism, especially once in power, has historically attacked both left, moderate right wing and the opposition in the radical right in order to maintain power. Right Wing: Fascists are fervently against: Marxism, Socialism, Anarchism, Communism, Environmentalism; etc – in essence, they are against the progressive left in total, including moderate lefts (social democrats, etc).Fascism is an extreme right wing ideology, though it can be opportunistic. 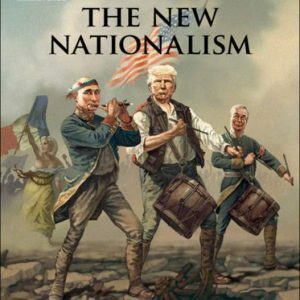 Nationalism: Fascism places a very strong emphasis on patriotism and nationalism.Criticism of the nation’s main ideals, especially war, is lambasted as unpatriotic at best, and treason at worst. State propaganda consistently broadcasts threats of attack, while justifying pre-emptive war. Fascism invariably seeks to instill in its people the warrior mentality: to always be vigilant, wary of strangers and suspicious of foreigners. 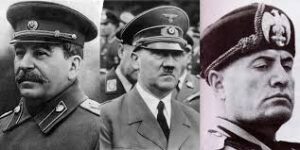 Hierarchy: Fascist society is ruled by a “righteous” leader, who is supported by an elite secret vanguard of capitalists.Hierarchy is prevalent throughout all aspects of society – every street, every workplace, every school, will have its local Hitler, part police-informer, part bureaucrat – and society is prepared for war at all times. The absolute power of the social hierarchy prevails over everything, and thus a totalitarian society is formed. Representative government is acceptable only if it can be controlled and regulated, direct democracy (e.g. Communism) is the greatest of all crimes. Any who oppose the social hierarchy of fascism will be imprisoned or executed. Anti-equality: Fascism loathes the principles of economic equality and disdains equality between immigrant and citizen.Some forms of fascism extend the fight against equality into other areas: gender, sexual, minority or religious rights, for example. Religious: Fascism contains a strong amount of reactionary religious beliefs, harking back to times when religion was believed to be “strict, potent, and pure”.Nearly all Fascist societies are Christian, and are supported by Catholic and Protestant churches. 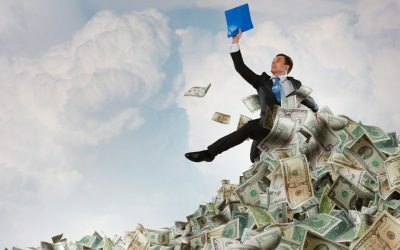 Capitalist: Fascism does not require revolution to exist in capitalist society: fascists can be elected into office (though their disdain for elections usually means manipulation of the electoral system).They view parliamentary and congressional systems of government to be inefficient and weak, and will do their best to minimize its power over their policy agenda. Fascism exhibits the worst kind of capitalism wherecorporate power is absolute, and all vestiges of workers’ rights are destroyed. War: Fascism is capitalism at the stage of impotent imperialism. War can create markets that would not otherwise exist by wreaking massive devastation on a society, which then requires reconstruction! Fascism can thus “liberate” the survivors, provide huge loans to that society so fascist corporations can begin the process of rebuilding. Voluntarist Ideology: Fascism adopts a certain kind of “voluntarism;” they believe that an act of will, if sufficiently powerful, can make something true.Thus all sorts of ideas about racial inferiority, historical destiny, even physical science, are supported by means of violence, in the belief that they can be made true. It is this sense that Fascism is subjectivist. Anti-Modern: Fascism loathes all kinds of modernism, especially creativity in the arts, whether acting as a mirror for life (where it does not conform to the Fascist ideal), or expressing deviant or innovative points of view.Fascism invariably burns books and victimises artists; artists who do not promote the fascists ideals are seen as “decadent.” Fascism is hostile to broad learning and interest in other cultures, since such pursuits threaten the dominance of fascist myths. The peddling of conspiracy theories is usually substituted for the objective study of history. Fascism stuns us with fresher and larger outrages, that make yesterday’s seem irrelevant, winnowing away our decency.Now, what was truly striking was that when the ban was announced, the response was furious. Fascism makes it more and more costly to be your better self. This shock-and-awe strategy of moral violation was an explicit goal of the Nazis — Hitler called it the Big Lie technique, to every day tell a bigger lie, and yesterday’s would soon be forgotten.— and it’s also one the Russians use today: to overwhelm us, until we are left numb and paralyzed by the sheer scale and scope of all these transgressions against civilization, wondering which outrage to speak out against first, and thus, we weary of morality itself. What is its effect? It raises the cost of being your better self. Fascism depends on fear and despair and a return to the past rather than a vision for a better society.People are fearful about what will happen to them, feel disenfranchised or feel like the country no longer cares about them, and want a return to “better times” in the past. Fascism proceed through a series of authoritarian collapses, each one a little more severe than the last. 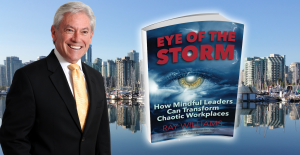 A series of actions by the leader(s) occur, sometimes on a daily basis, so that people begin to feel like it’s the norm, or become numb because of the overwhelming stressful impact. Fascism is just like an epidemic of a lethal virus.Those who follow the leader take their cues from him, and have license to act in the same ways because they know there will be no or little consequences. Behavior becomes viral. Sixty-eight percent of voters polled by two researchers believed the president’s repeated claims that widespread “voter fraud” cost him the popular vote in the 2016 election, and 52 percent said they would support postponing the 2020 election in order to make sure only “legal” citizens cast ballots. Fifty-six percent answered that they would support the measure if Trump and Congress approved of it. “At a minimum, [the survey results] show that a substantial number of Republicans are amenable to violations of democratic norms that are more flagrant than what is typically propose.”—Ariel Malka and Yphtach Lelkes, Washington Post. Fascism targets a ethnic, religious or minority or group to blame all problems on and persecute and punish them. In Germany, “mercy killing” became the policy. Over 270,000 handicapped people were killed because in Germany,murder had become “mercy.” Pastors went to call on their elderly members in hospitals and they had disappeared. Systematic attacks on the media. Often referring to the news media (except his news outlet, Fox News) as the “enemy of the people,” and “fake news,” there’s little doubt that Trump and his associates have repeatedly tried to intimidate mainstream media organizations, whether through tweets deriding the supposedly “failing” New York Times, the repeated references to the “Amazon Washington Post,” or White House chief strategist and former Breitbart head Stephen Bannon’s referring to media organizations as “the opposition party.”Trump and Fox News also falsely accused the Times of thwarting efforts to kill or capture top Islamic State leaders, and the White House has arbitrarily excluded reporters of some organizations from press pools, press conferences, and other events. And in the lead up to the mid-term elections, Trump harangued his audience non-stop about the “criminal and diseased” immigrant caravan that was going to invade the U.S. and attack innocent American citizens. And that’s just a small sample of Trump’s war on the press. Building an official pro-Trump media network: There’s little doubt Trump has tried to favor outlets that embrace him, which is why the White House gave press credentials to the right-wing blog Gateway Pundit and has given the reliably wacky and pro-Trump Breitbart privileged access. And as one might expect, the Trump administration has backed the expansion plans of the conservative Sinclair Broadcast Group. But Fox News and Sinclair act more like the administration’s publicity firms than independent news organizations. Politicizing the civil service, military, National Guard, or the domestic security agencies.An obvious counterweight to executive overreach are career civil servants who remain sensitive to precedents, have lots of expertise, and tend to follow the rule of law. And as Samuel Huntington pointed out many years ago, an important barrier to excessive militarization is having a professional military whose direct political role is limited. Trump has taken steps to politicize the civil service in various ways or turn the military and the intelligence and domestic security agencies, including the Department of Justice into tools of the White House instead of independent defenders of the Constitution.He has demanded that senior officials resign or by firing people who declined to do his bidding, such as (now former) Deputy Attorney General Sally Yates and FBI Director James Comey. He has declined to make top appointments in a number of agencies, at one point telling Fox News, “A lot of those jobs, I don’t want to appoint, because they’re unnecessary.” Trump has also questioned the integrity of the nonpartisan and highly respected Congressional Budget Office, and he crossed another line by telling uniformed military personnel to call Congress and lobby for his defense spending and health care proposals. Enforcing the law for only one side. A systematic crackdown on left-wing opposition has not occurred, but Trump & Co. do not seem at all concerned by the growing level of right-wing extremism in the country and utterly indifferent to such tendencies abroad. Trump has been quick to condemn terrorist attacks by Muslims and the shooting of Rep. Steve Scalise (R-La.) in June but said nothing after a disturbed right-wing sympathizer murdered an innocent black American and also when an Israeli-American teenager issued a series of bizarre threats against Jewish synagogues and community centers. Even more disturbingly, it took Trump more than two full days to respond to the brutal knife attack by a white supremacist that killed two people in Portland, an act he described laconically as “unacceptable.”Some would argue that his response to the bomb threats sent to Democratic leaders was tepid at best, and his response to the shooting at the Pittsburgh Synagogue as not unequivocal. Trump’s disregard for the rule of law is pretty well-established by now, and he has made it clear that he doesn’t think he, his family, or his closest aides should be subject to much legal scrutiny. Yet Trump also likes to portray himself as a “law and order” guy and has backed “beleaguered” Attorney General Jeff Sessions’s controversial campaign to reimpose draconic prison sentences. It is hard to escape the impression that Trump thinks the law is something that applies to other people — and mostly to those who probably didn’t vote for him. Questioning the validity of the election system unless it’s in his favor. Trump lost the popular vote by a considerable margin — really! —but he became president due to the peculiarities of the Electoral College. The demographics of the U.S. electorate give him (and the Republican Party) a big incentive to try to stack the deck in his favor, and that incentive only increases the lower his approval ratings go. How else can one explain the transparently bogus “voter fraud commission,” headed by die-hard voter suppression advocate Kris Kobach? No serious scholar of U.S. voting behavior believes that electoral fraud is widespread or politically consequential, but Trump, Kobach, and others would like to make it as hard as possible for people they deem unlikely to vote their way to actually go to the polls. Fearmongering. As he did during the campaign, Trump has continued to issue dark warnings about various dangers from which he supposedly needs to protect us. His inaugural address conjured up a weird, Gothamesque description of “American carnage,” and a recent speech in Poland openly asked whether “the West” still had the will to defend itself. He has continued to rail against Muslims (except for the rich ones in Saudi Arabia) and to inflate threats from North Korea and Iran. And he has stoked fear about immigrants. Witness the fear campaign about the immigrant caravan from central America headed to the U.S. border, composed of as Trump described them, of rapists, murderers, middle eastern terrorists and disease ridden people. Creating a scapegoat(s) who is/are intent on destroying America.Trump has targeted immigrants, particularly Hispanics, and non-whites as the “enemy” who threaten American “national security” and safety. This includes the separation of immigrant children from their parents and establishing detention camps for them. Demonizing anyone who opposes him. No American president has been as prone to treat his opponents with contempt, disregard, and blatant hostility. Trump spent the campaign belittling his Republican opponents and vowing to “lock up” Hillary Clinton. He has continued to blame America’s problems on everyone but himself, accuse anyone who opposes him of betraying the country, and offers self-pitying “tweetstorms” about the vast opposition he faces from his supposed enemies (some of whom used to be allies). Using the language of “nationalism,” ignoring its connotations in history in Germany, Japan and Italy. In his America first policy, and his withdrawal from international treaties and agreements, his rhetoric and action is both insular and stokes the aggressive attitude in his followers of “us and them,” and the rest of the world being against the U.S. Therefore, trade, and international relations including relationships are pursued from the perspective of how it will benefit America only. Surrounding himself with sycophants and corrupt people who are blindly loyal and acting out of their own self gain. Trump is unwilling and unable to separate his own personal financial and personal interests (and those of his businesses) from that of the Presidency and the country, raising serious constitutional, legal and ethical concerns.His loyal followers and appointees have taken the cue from him, and already been embroiled in corruption and unethical practices. Seeking to operate mostly through the power of the Presidency and his administration (eg: Executive Orders and Directives). He sees the other equal branches of government (Congress and the courts) as only valid and useful if they serve his interests and agree with him. Deliberately and frequently lying to the American public.The Washington Post and other media outlets have fact-checked Trump’s statements. The Fact Checker’s database analyzes, categorizes and tracks every suspect statement uttered by the president. As of day 558, he’s made 4,229 false and misleading claims — an increase of 978 in just two months. That’s an overall average of nearly 7.6 claims a day. Autocrats and dictators throughout history have been known to use false information and lies as a way of controlling the populace. President Trump, Senator Marco Rubio, Governor Rick Scott of Florida and Georgia’s Brian Kemp have all falsely accused Democrats of trying to steal elections. “An honest vote count is no longer possible,” Trump tweeted yesterday. Kemp’s campaign accused his opponent, Stacey Abrams, of “making up numbers.” Scott told Fox News that Senator Bill Nelson, his Democratic opponent, is trying “to steal this election.” None of these claims are true. And they’re damaging. “The new voting wars threaten to undermine the very foundation of American democracy: that election officials can fairly and accurately count ballots and that they can declare a winner whom the losers will accept as legitimate,” writes Richard Hasen in Slate. “When electoral procedures lose popular legitimacy, it is nearly impossible to get that legitimacy back,” argues Tom Pepinsky, a Cornell political scientist. “We’re in a dangerous place as a country,” says Brendan Nyhan of the University of Michigan. 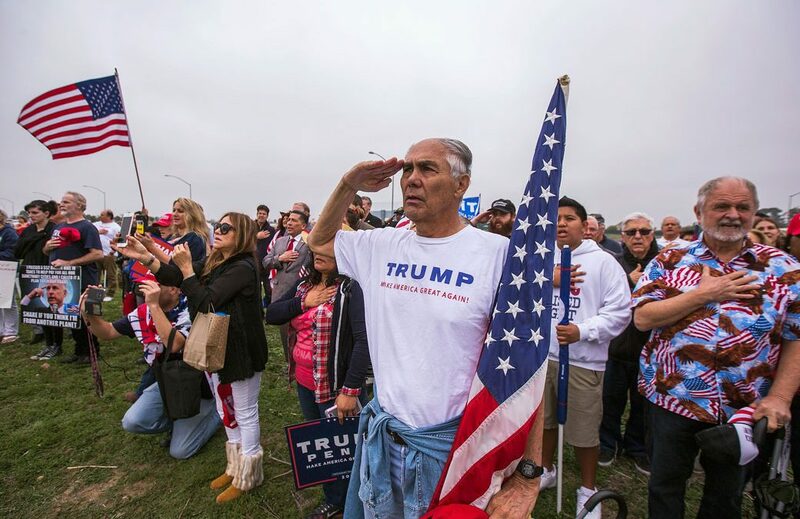 Journalist Julia Conley in her article, cites criticspointing to a new poll as evidence that Trump’s base would likely support him even if he were to propose postponing the 2020 elections. Harvard law school dean Martha Minow recalls the internment of 120,000 Japanese, including 70,000 American citizens, during the second world war. Despite intense “contemporaneous dissents” and “scholarly criticism”, the supreme court has never overturned the decision that made that horrendous episode possible. A Trump spokesperson even cited it as a worthy precedent for his proposed registry of immigrants from Muslim countries. An influx of newly released political books—from former presidential speechwriter David Frum’s Trumpocracy to Harvard professors Steven Levitsky and Daniel Ziblatt’s How Democracies Die—argue President Donald Trump is subverting American democracy into an authoritarian state. “The appeal and superiority of constitutional democracy cannot be taken for granted,” I says Professor David Law of Washington University in St. Louis and The University of Hong Kong. “Many fear that constitutional democracy is under threat from democratic backlash and losing ground to illiberal constitutionalism.” David Law and research partner Mila Versteeg of the University of Virginia Law School concluded some time ago that the American Constitution is no longer the model for most nations seeking to write a new document for themselves. Instead, many have looked to the Canadian constitution, with its respect for basic human rights and human values and a social and political system that more closely represents a vision of the world that they would like to see their government embrace. Orwell once said: “in a time of universal deceit, telling the truth is a revolutionary act.” If that phrase were a test, would you say that we — in fact you, yourself — are passing or failing it? Why don’t Americans seem to have any power over the authoritarian and fascist forces and tendencies in their midst? Why have those forces run amok, gleefully shattering institution after institution, norm after norm, to the point that concentration camps for infants have arisen in just two years — mere months — after the election of a demagogue? More than any other political system, democracy—as Plato pointed out long ago—has the inherent ability to actualize its own demise. By manipulating the democratic process, elites can limit the freedoms of individuals or social groups and put in place authoritarian and autocratic leaders who are not democratically inclined. In a very concrete sense, democracy depends upon ordinary citizens’ capacities and motivations to absorb democratic values and tolerate those with diverse social, cultural, ethnic, and ideological backgrounds. These are precisely the values that those on the right wing have been attacking for years, and they have exploited the inherent popularity of conservative ideology to do so. Whatever the proximal psychological causes, we are bearing witness—all over the world—to the rebirth of extreme right-wing movements that thrive under conditions of anxiety. These movements promise a return to “traditional” (often religious) values, a curtailing of reproductive and other rights of women (as well as sexual minorities), and a revival of nationalistic (often ethnic) pride and the “restoration” of national boundaries, along with a dismantling of the “administrative” welfare state and the imposition of illiberal reforms and vindictive immigration policies. Once in power, right-wing movements flirt with (and sometimes embrace) totalitarian practices, such as intimidating and even incarcerating protestors, journalists, academics, and any others whom they find potentially threatening or disruptive. With the support of conservative voters, illiberal governments have gained power in Hungary, Poland, Turkey, and many other countries. Radical right-wing parties are also resurgent in Germany, Austria, Switzerland, the Netherlands, France, and the United Kingdom. Understanding mass psychology in this day and age, and the ways in which authoritarian politicians have so successfully tapped into it, is of paramount importance for understanding how this happened and how it can be fought; that is, for the long-term preservation of democratic systems. To think and believe that America will retain its commitment to a vibrant democracy, and that any threats to it, including the authoritarian leadership of Donald Trump is only a temporary aberration, soon to be over so things can return to normal is wishful thinking and ignores the requirement that an informed and active citizenry that represents all the citizens and protects democratic institutions. There’s an old story about how to boil a frog—you turn up the heat incrementally, but it is only aware of mild discomfort along the way and does nothing to save itself.